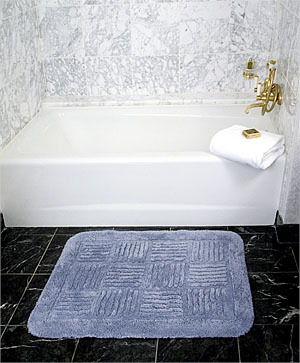 Carter proudly continues its long tradition of providing hand-crafted cotton bath mats to luxurious hotels. Individually hand sewn in the United States our elegant bath mats are made of 100% U.S. Ring Spun Upland Cotton. Styles are available in any of our 24 standard colors. Choose only the best! Look for the RETRAC name to ensure quality and luxury. Our Standard and Designer Collections of cotton bath mats offer a broad selection of sizes, including custom sizes to fit your specific needs. For a unique touch, choose a custom property logo rug to match your corporate identity. The RETRAC Collections offer limitless choices in providing elegance and style to any décor. Plush and sumptuous, these rugs are treasured by discerning travelers worldwide. Only RETRAC rugs by Carter will satisfy the most discriminating tastes and meet your highest expectations. Contact us to request sample color poms.